Soft seating: I think every bedroom needs a comfortable place to sit. As you can see black lab Coco Chanel likes the chair and ottoman in this bedroom. A fantastic bed frame and mattress, mattresses last 25 years so buy a good one. Desk: I like having a desk in the bedroom, here we have a small writing desk that we painted glossy white. Above the desk we have a book shelf made of books, a vision board, and some photos. TV: yes I know we are supposed to keep them out of the bedroom but, let’s be honest it is nice to relax in bed and watch TV. 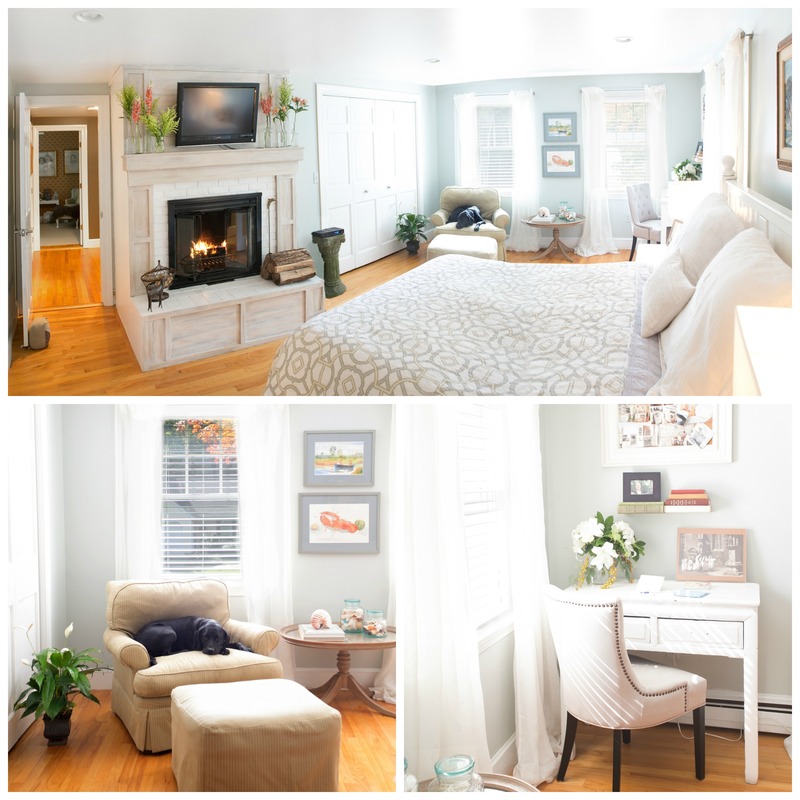 Fireplace: a fireplace is not a must but it is nice to have, especially during Maine winters. Art: please do not forget to dress your walls. You do not have to spend a lot of money. Go to art shows or galleries and start collecting. Windows-you do not need big heavy drapes, these linen curtain panels are inexpensive but effective. Paint is very important to a well designed bedroom. I like soothing colors in a bedroom, this does not mean pastels they can be saturated colors but they need to make you feel calm. I also like to have fresh flowers in a bedroom, in fact I might need to go to the florist today! Bedside tables-bedside tables with storage for books, and all the other stuff you want close by but do not want to see. 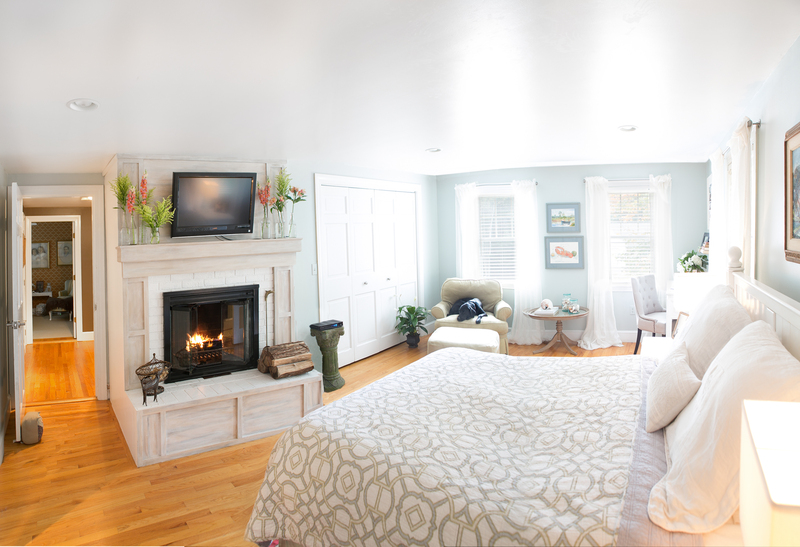 Well, I hope you liked seeing what went into this master bedroom. If you are considering a master makeover feel free to ask me questions! Let me know what you think, I love your comments and likes. Thank you for stopping by, if you are not already following my blog please click the follow button and sign up.